Shown here with sunbutter, berries, raw cacao nibs, hemp hearts, and bananas. Bananas aren’t really a superfood, but they’re a healthy way to sweeten your dish. I love to spend a slow morning with people and food that I love! Pancakes are really a staple food of childhood, and I’m so glad that I can give my children a healthy version of them! These paleo pancakes are gluten and dairy free, low carb, and when you top them with superfoods, you’ll start your day satisfied and supercharged! Most people stick with butter and maple syrup for their pancakes, but I wanted to take these pancakes to a whole new level of healthy and tasty! You can use a little pure maple syrup or reduced sugar jelly (not with fake sweetener, just with less sugar added…Trader Joe’s carries it) to sweeten them up a bit, but I didn’t find it necessary. 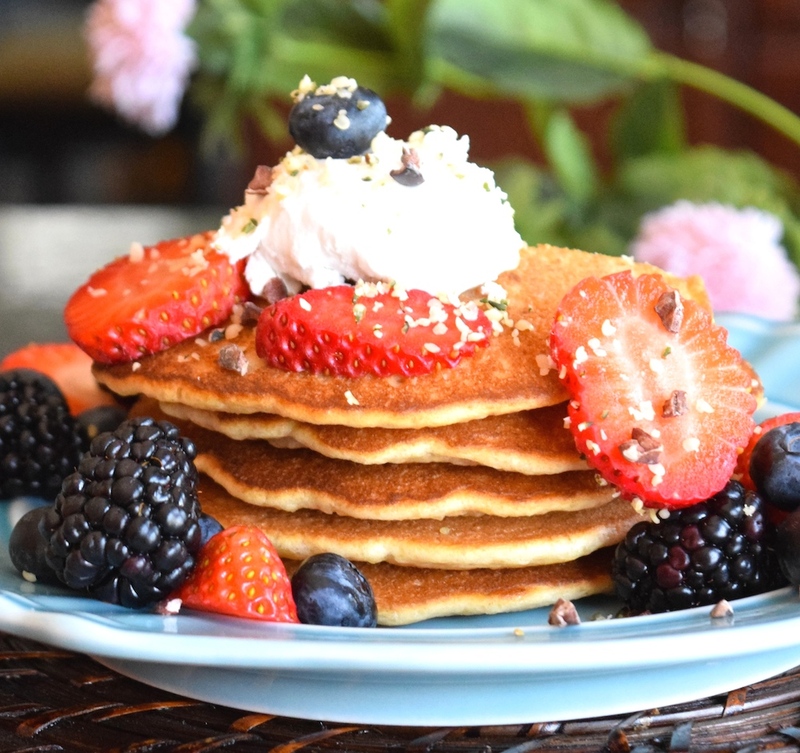 Berries, almond butter, raw cacao nibs, hemp hearts, and coconut cream are my favorite pancake toppings. I love to use full fat coconut cream in place of whipped cream. It is naturally sweet, and contains medium chain fatty acids that are easy for your body to metabolize and burn. To make it the consistency you see in the picture, simply refrigerate it long enough for it to set up, then scoop it out onto your pancakes. You may wonder why I use berries so often, and there are a couple of reasons. First, of course, they taste really good. Second, they pack a powerful nutritional punch, while being lower in sugar than most other fruits, which puts them in the category of superfoods in my book. Berries are very high in antioxidants, fiber, flavonoids, and polyphenol compounds, which are anti-inflammatory. Blueberries and blackberries contain anthocyanins, which are a superhero of the nutritional world, because they help fight against cancer and heart disease. 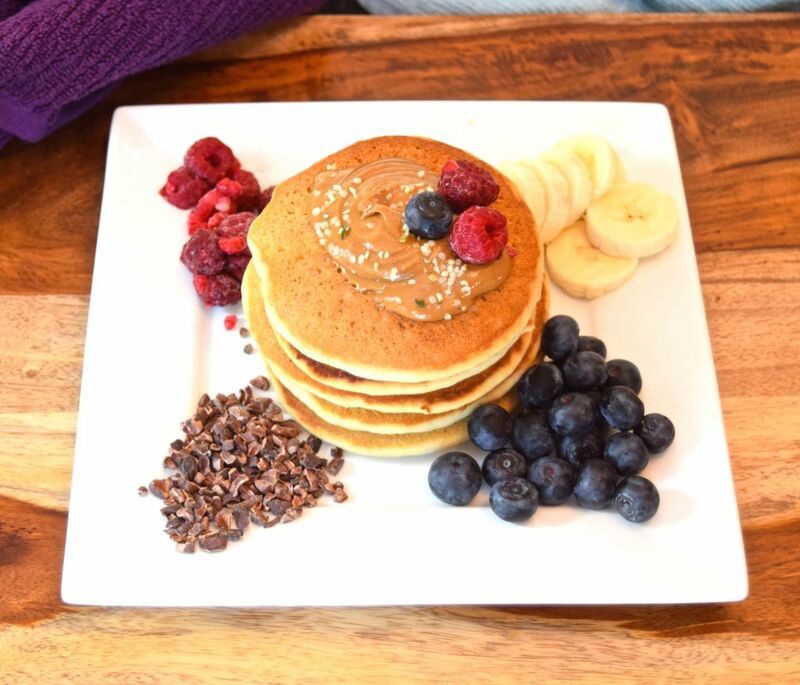 Before we get to the recipe for the paleo pancakes with superfood toppings I want to invite you to join with others who are making healthy changes. I’d love to walk alongside you in your journey towards wholeness and health! Jesus said, “I have come that they may have life, and have it to the full!” Freedom from food addictions is part of having a truly full life. 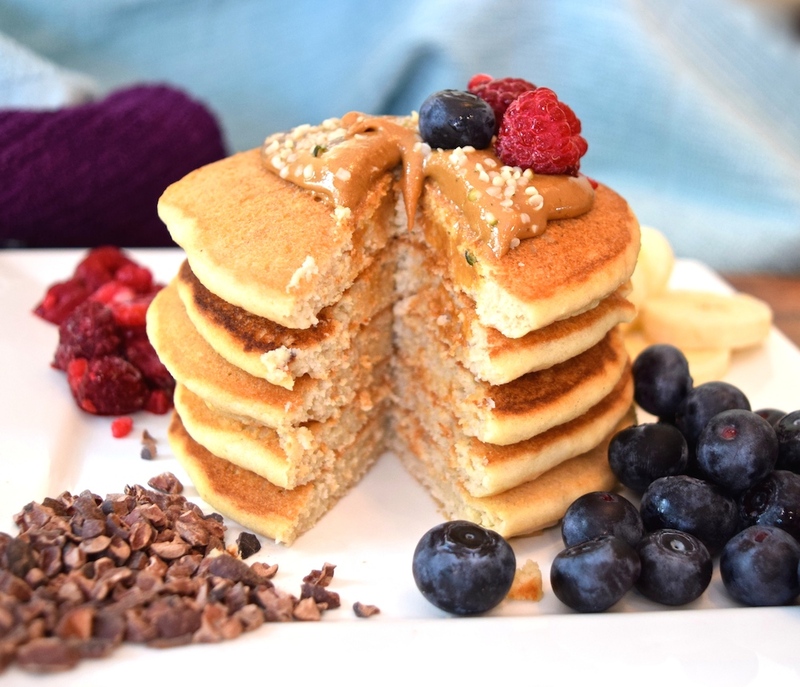 These paleo pancakes are gluten and dairy free, low carb, and when you top them with superfoods, you'll start your day satisfied and supercharged! First, make sure your nut flour is ready. If you're starting with whole nuts, grind them up in your food processor to a fine consistency. I prefer the flavor of cashew flour over almond, and it's lower in fat. Nuts have healthy fats, but should still be eaten in moderation. Heat your griddle to 350 degrees F. Combine the dry ingredients in a large bowl, and the eggs and coconut oil in a small bowl. Pour the eggs and coconut oil into the dry ingredients, while mixing. At this point the mixture will be pretty dry and crumbly, which is fine. Slowly pour in 2 cups of almond milk, while mixing the batter. It works best in an electric stand mixer. Add enough almond milk to make your batter the right pancake consistency. It should be loose enough to pour into pancake shapes, but not watery. I sometimes add even more than 4 cups, but start small. You can always add more after the first batch if they're too thick. Spray your griddle with coconut oil, then scoop out the pancakes and pour about 1/3-1/2 cup per pancake. Let them set up and brown on one side, before flipping to brown the other side. It's usually time to flip when bubbles form in the wet pancakes and spread all the way into the middle. Play around with it a little and cook them the way you like them! Remove pancakes from the heat when they're brown on both sides and cooked all the way through. Set out our superfood toppings, buffet style, and let people add whichever ones they prefer. Enjoy! One Response to "Paleo Pancakes with Superfood Toppings"